Searching for cabins rentals in Tennessee for your wedding party, class reunion, family gathering, or your next company retreat? The luxurious 3-story Sherwood Splash Lodge vacation home rental near Pigeon Forge sleeps up to 52 people in comfort and style with plenty of space for everyone. The Smoky Mountain lodge’s 8,500 sq feet includes 11 bedrooms, 9.5 baths, and a huge open concept kitchen/dining room area that can seat large crowds easily at multiple tables with beautiful views of the mountains. The lodge is located within the gated Sherwood Forest Resort, less than a 2-mile drive from the Pigeon Forge Parkway. There is parking for 10 vehicles at the property, and the driveway can accommodate even buses or limousines. The secluded log rental home’s upper and main floors each have 4 bedrooms. The lower level has 3 additional bedrooms, so there is flexible space for families vacationing together. All bedrooms have their own cable/connected TV when you just want the privacy of your own room to watch your favorite TV shows. There are multiple seating areas on different levels where groups can gather together for separate activities. The home theater in the lower level seats 33 people, there is an indoor pool, and a game room with pool tables and arcade games offers many entertainment options. Want to just sit back, relax, and take in that fresh mountain air? The 3,000 square feet of decks on two levels across the back of the lodge with comfortable seating and two hot tubs gives you lots of space to enjoy the outdoors and majestic views. The fully equipped gourmet kitchen was designed for multiple cooks feeding large groups. It has granite counter tops, double stoves and microwaves, double dishwashers, double sinks, an oversized refrigerator/freezer with ice-maker, two toasters, two coffeemakers, blender, cookware, dishes, silverware, and cooking utensils. There are multiple tables and chairs in the massive connected dining area that will seat a large crowd. No need to dine in shifts in this impressive open kitchen/dining area with a huge stone-faced floor to ceiling gas fireplace shared with the great room. A washer/dryer is on the lower level. Sleeping Arrangements: Bedroom 1 - 1 king bed; Bedroom 2 - 1 king bed; Bedroom 3 - 2 king beds; Bedroom 4 - 2 king beds; Bedroom 5 - 2 queen bunk beds; Bedroom 6 - 1 bunk bed; Bedroom 7 - 2 queen bunk beds; Bedroom 8 - 2 king beds; Bedroom 9 - 2 king beds; Bedroom #10 - 1 full/twin bunk bed; Bedroom 11 - 1 king bed; 2 queen sofa sleepers in great room; 2 queen sofa sleepers in loft sitting area. It’s rare to find such a new, spacious, gorgeous mountain retreat specifically designed to accommodate up to 52 people - offering large gathering areas as well as smaller, quiet spots for group activities on each of the three levels. There are two levels of decks (almost 3,000 sq ft) for games, dining, and relaxing in the rockers or hot tubs. No need to try and figure out how to feed large crowds at restaurants. You literally have your own great room/kitchen/dining hall where everyone can sit down for one group dining experience. The lower level of the lodge has an indoor pool, home theater with a projection screen, and game/arcade room. Guests can also use the resort’s outdoor pool in the summer. There are plenty of options to enjoy a swim year round. And with a TV in each bedroom and free WiFi, no one should be bored. It’s just a 2-mile drive into Pigeon Forge. 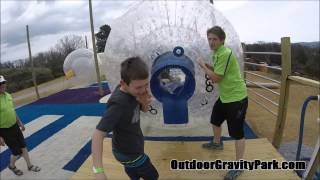 At the Outdoor Gravity Park you can take a memorable ride in an OGO - a very large transparent ball. The exciting sport of Zorbing originated in New Zealand, and Pigeon Forge is the only location in the United States where you can try rolling down a 1,000 foot grassy hill in a giant ball partially filled with water. If you plan ahead, you can book the park for your own private party or group event. After your zorbing adventure, it’s going to feel great returning to your Smoky Mountain lodge retreat for a soak in one of the deck’s hot tubs. There are lots of hiking options for old and young. Families with younger children and strollers will enjoy the Riverwalk Trail along the Little Pigeon River. The two-mile paved trail is a great spot to watch the ducks play and take in a bit of the local scenery. 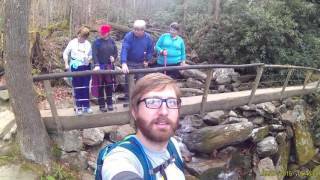 More adventurous groups will want to set out on the some of the 800 miles of trails in the Great Smoky Mountains National Park. This spectacular mountain park encompasses 500,000 acres and 95% is forested, so you are guaranteed to see some breathtaking waterfalls, crystal clear streams, and abundant wildlife. The nearby Alum Cave trail takes you on a 4.4-mile round trip journey through local history and the Arch Rock. Final pricing will include fees in addition to rent; including a non-refundable damage waiver, reservation fee, local and state tax. No discounts. The house was amazing! We had 26 people, representing 9 families from Georgia, Tennessee, Kentucky, Maryland, and Ohio! Everyone had their own room and there was so much space to spread out in! The pool was a hit with our under 10 crowd! The humongous dinning room table held us all for the many meals we cooked and ate! The kitchen was spacious and we easily fixed 8 meals for all! Plenary of dishes (loved the two dishwashers) and pots and pans! The cabin was nicely decorated for Christmas also. We had plenty of room to stretch out and enjoy ourselves. Although the purpose of the trip was a bonding experience for our company and their families, we did not want to feel like we were crowded. With enough rooms and bathrooms to accommodate all the guys, their wives and kids, we were able to have great bonding time without compromising our personal space. The only thing we didn't like is that the cabin was a little closer to the bottom of the mountain and the view wasn't the best. The convenience to Pigeon Forge and Gatlinburg more than made up for it, though. We were everywhere we wanted to be in less than 15 minutes. Would recommend this to anyone doing a company retreat or large family gathering.